Posting Inilah Sunset dan Sunrise terbaik di Yogyakarta ini sayang kalau tidak di publikasikan, barang kali rutinitas kemegahan sirklus atau lukisan alam nyata di Yogya yang indah ini juga di butuhkan oleh turis dari mancanenegara penggila Sunrise lainnya. Karena aslinya artikel ringkas yang mengupas tentang Sunset ini saya kirimkan untuk menjawab pertanyaan wisatawan dari negara Matahari Terbit Jepang yang berencana memburu Sunset di Jogja untuk waktu 3 hari 2 malam. 1 Sunrise and Sunset Ancient Volcano Nglanggeran. Mount Nglanggeran an ancient volcano in the form of a giant boulder. Quite tracking 1 hour you will reach the top and enjoy the beauty of the universe from a height. Besides nice to see the sunset in the western peak, Ancient Volcano Nglanggeran also has a stunning view of the sunrise, especially the East Peak. To reach this location you have to walk from West Peak about 2 hours with challenging terrain or riding a motorcycle past the winding road then continued tracking 10 minutes. If the weather is clear, from the East Peak of Mount Nglanggeran you can watch Lawu, Mount Merapi and Mount Merbabu. At the peak of this mountain Tumur only inhabited by 7 heads of households. Address: Jalan Prambanan - Piyungan Km 3, Sleman, Yogyakarta. Located on a high hill, the ruins of the magnificent palace complex built in the 8th century is the perfect place to watch the sunset landscape. In accordance with a first name, Abhayagiri Vihara (monastery in a peaceful hill), Ratu Boko Palace Complex presents peace combined with beauty. 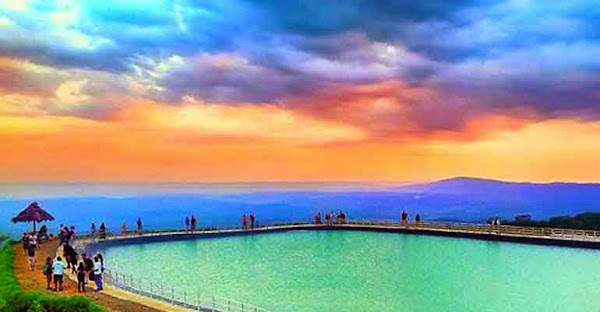 In this place you will witness the dazzling sunset set in the Mount Merapi and Prambanan in the distance. If the evening passed and night began to come in, you can relax at the cafe with a dish of view of flickering lights in the village slopes of Merapi. To get to the Ratu Boko Palace, could use TransJogja Bus fare (Rupiah) IDR 3,500, - (about USD 3). Then proceed ride a motorcycle taxi (for motorcycles) around IDR 30,000, - (about USD 2.6 dollar exchange rate) To go Nglanggeran I recommend using Guide. (guide in Yogya rates average around USD 25.Two-wheel motorcycle rental rates about $ 7 a day for 2 people plus helmet and rain jacket). The third day you can visit Parangtritis beach to see Sunrise. The trick of the city of Yogyakarta can ride public transportation with onkos around £ 5000, -. But if you want a comfortable two-wheel motorcycle rental is more practical, because the distance from the terminal to the beach still have to walk. 2 Komentar untuk "Inilah Sunset Dan Sunrise Terbaik di Yogyakarta"